These Violins and Violas are in size and measurements copies of famous old instruments. Only the best seasoned old curly maple and finest spruce is used. The best in workmanship and appearance. Stradivarius model, selected seasoned maple, fine spruce top, rich golden‑brown shaded and imitated. Guarnerius model, well flamed maple back, old fine grain top, golden‑reddish shading. Stradivarius model, selected old flamed wood, best spruce top, old‑yellow imitation of old. Stradivarius or Guarnerius model, best old seasoned wood, fine golden‑brown shading. Viola: 16", 16 ½" body lengths. 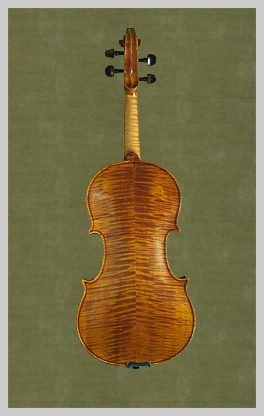 Stradivarius or Guarnerius model, best selected old wood, fine amber varnish, slightly shaded. Best Hill style boxwood fittings.